Who should not take Botox Vial? It is also used to treat severe underarm sweating. Botulinum toxin works by blocking the chemicals that turn on the sweat glands. This medication is given by injection by an experienced health care professional. It is injected into the affected muscles (intramuscularly) when treating eye disorders, muscle stiffness/spasms, and wrinkles. When used to prevent migraines, it is injected into the muscles of the head and neck. It is injected into the skin (intradermally) for the treatment of excessive sweating. When treating overactive bladder, it is injected into the bladder. What conditions does Botox Vial treat? A very serious allergic reaction to this drug is rare. However, get medical help right away if you notice any symptoms of a serious allergic reaction, including: itching/swelling (especially of the face/tongue/throat), rash, severe dizziness, trouble breathing. List Botox Vial side effects by likelihood and severity. Before using this medication, tell your doctor your medical history, especially of: bleeding problems, eye surgery, certain eye problem (glaucoma), heart disease, signs of infection near the injection site, urinary tract infection, inability to urinate, muscle/nerve disorders (such as Lou Gehrig's disease-ALS, myasthenia gravis), seizures, trouble swallowing (dysphagia), breathing problems (such as asthma, emphysema, aspiration-type pneumonia), treatment with any botulinum toxin product (especially in the last 4 months). It is not known whether this medication passes into breast milk. What should I know regarding pregnancy, nursing and administering Botox Vial to children or the elderly? Some products that may interact with this drug include: certain antibiotics (e.g., aminoglycosides such as gentamicin, polymyxin), anticoagulants (e.g., warfarin), Alzheimer's disease drugs (e.g., galantamine, rivastigmine, tacrine), myasthenia gravis drugs (e.g., ambenonium, pyridostigmine), quinidine. 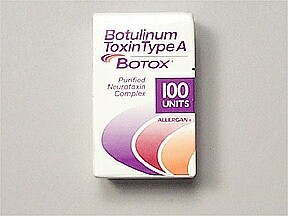 Does Botox Vial interact with other medications? Not applicable. This medication is given in a hospital or clinic and will not be stored at home.Information last revised May 2017. Copyright(c) 2017 First Databank, Inc.
Are you taking Botox Vial? Are you considering switching to Botox Vial? How long have you been taking Botox Vial?